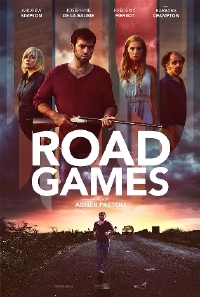 This trailer for the UK/France co-production, Road Games, isn't new, but for some reason this film flew under our radar until IFC Midnight were kind enough to sent us note about the film's release on VOD Friday, March 4. This is UK director Abner Pastoll's first feature and it looks great. A cursory glance on IMDB tells me the film was very well liked on the fest circuit and is being described as "Hitchcockian" by a lot of folks. Certainly, this is my kind of trailer. All tone and no spoilers. I'm in. After a disastrous summer trip, Jack finds himself hitchhiking through the sun-drenched rural French countryside with nothing but his British passport. Unaware of dangers that are plaguing the roads, he tries without much success to get home. Along the way, he partners up with another hitchhiker, a beautiful French girl, VÃ©ronique. But when they accept a ride from a local oddball (FrÃ©dÃ©ric Pierrot), the pair finds themselves thrown in a deadly game of cat and mouse in which nothing is what it seems. Bursting with nonstop twists and turns and an undercurrent of Hitchcockian malice, this riveting psychological thriller is a hell of a ride. Road Games stars Andrew Simpson, Josephine De La Baume, Frederic Pierrot, Barbara Crampton and Feodor Atkine.